Are there 6 species of giraffe? The world's tallest animal, the giraffe, may actually be several species, a study has found. A report in BMC Biology uses genetic evidence to show that there may be at least six species of giraffe in Africa. Currently giraffes are considered to represent a single species classified into multiple subspecies. The study shows geographic variation in hair coat colour is evident across the giraffe's range in sub-Saharan Africa, suggesting reproductive isolation. "Using molecular techniques we found that giraffes can be classified into six groups that are reproductively isolated and not interbreeding," David Brown, the lead author of the study and a geneticist at the University of California Los Angeles (UCLA), told BBC News. "The results were a surprise because although the giraffes look different, if you put them in zoos, they breed freely." The study also found that the two giraffe subspecies that live closest to each other - the reticulated giraffe (Currently: Giraffa camelopardalis reticulate) in North Kenya, which has reddish round spots; and the Maasai giraffe (Currently: Giraffa camelopardalis tippelskirchi) in South Kenya - separated 0.5 to 1.5 million years ago. These results are interesting as giraffes are highly mobile animals. They frequently range over several hundred square kilometres and are capable of long distance movements of some 50-300km (30-170 miles), which means different populations are likely to meet. Mr Brown added: "There are no rivers or forests to prevent breeding, but some evolutionary process is keeping the two groups reproductively separated." The researchers have suggested this separation may be being driven by ecological differences, such as differences in vegetation at a micro-level, or even sexual selection. "The female Maasai giraffe may be looking at the male reticulated giraffe and thinking, 'I don't look like you; I don't want to mate with you'," Mr Brown explained. Mr Brown also highlighted the conservation implications of this study: "Lumping all giraffes into one species obscures the reality that some kinds of giraffe are on the brink. Over the past decade there has been a 30% drop in giraffe numbers, with total numbers under 100,000. 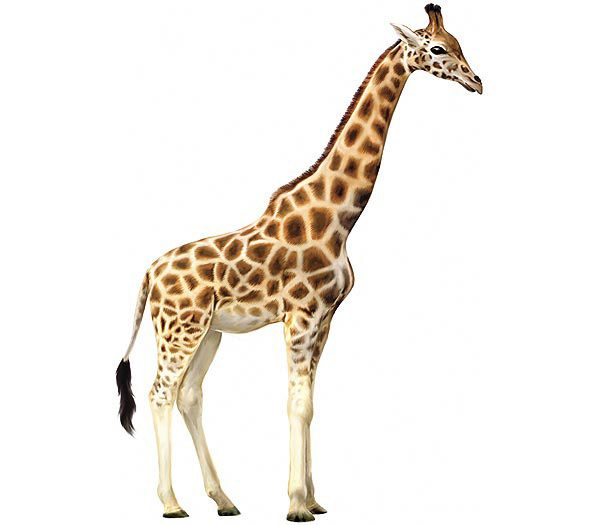 The Nigerian giraffe (Currently: Giraffa camelopardalis peralta). The last 160 individuals are found in found in West and Central Africa. The Rothschild giraffe (Currently: Giraffa camelopardalis rothschildi). The last few hundred can only be found in a few protected areas in Kenya and in Murchison Falls National Park, Uganda. The animals' status is currently under review by an International Giraffe Working Group (IGWG). Its evidence will inform the IUCN Red List of threatened and endangered species. The genetic research was supported by the US-based Wildlife Conservation Society.